I did a lot of research before deciding to have my Forerunners Healthcare at my consultation with you and your staff I felt so comfortable that I had no doubt this is the right place for me to have my surgery done. . I am eternally grateful to you for making arrangements for me to fly to India just within 3 days, which is incredible. You have worked a miracle and I am glad that you helped me to achieve what I have always dreamed of having. Wonderful thinner thighs and a flat tummy. I can't thank you enough, and I will always keep you in mind if I, or anyone else I should know could use your services. I couldn't have asked for or wished for a better Doctor. You were there for me to ask questions of before and after and you calmed my nerves on the day of the surgery. You were even there for me when I was sick. I don't know too many Doctor's that would care that much about their patients. Thank you. I want to also thank you for the encouraging comments that kept me going from day to day. Again… I can't thank you enough. Dr Dheeraj, You couldn't have been more knowledgeable in what you do and what you did for me. Thank you for setting up the surgery for me and Thank you answering every question I had before and after I met with Surgeon. Thank you for your honesty and sincerity in what you told me about the surgeries. Thank you for being the one who always helped to schedule my appointments to see the surgeon. Thank you for being so considerate and nice. THANKS!!! I would recommend him to all my friends. He made me very comfortable and he changed my life. I am so much more confident now than I was before. 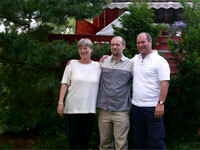 Mr Brian Soerensen from Denmark who took a “REJUVENATION PACKGAE” of 7 days at the Kairali Ayurveda Resort in Kerala. The services offered were fantastic. Everyone treated us as if they were personal assistants. The ayurveda doctors were extremely professional and completely competent. My best wishes to Dr Dheeraj Bojwani and Forerunnershealthcare Consultants. Mrs Sofia Haraldsen from Norway who had surgery for Knee Replacement in India. After having been diagnosed with Osteo- arthritis in my left Knee two years ago we began to look at the inevitable solution, which would be surgery. The Wockhardt Group came to our notice after seeing an article about Forerunnershealthcare Consultants. We studied their website and after reading the details of Wockhardt Hospital, Mumbai and the Orthopaedic team led by Dr. Malhan, we decided to contact them. From that point the whole experience has been one of total professionalism at all levels. 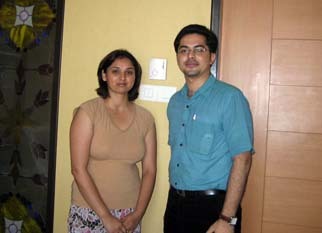 Dr Dheeraj Bojwani answered all questions both medical and personal promptly and precisely. We received regular visits by other members of the medical team as well as the Head of Nursing on her rounds. Dheeraj Bojwani-MD-International Patient Consultant of Forerunnershealthcare Consultants also made regular get-well calls to ask about my progress. The support services of housekeeping, maintenance and catering were all first class providing a total service that would be difficult to match. I have no hesitation in recommending to anyone considering Joint Replacement surgery, the services of Dr Dheeraj Bojwani of Forerunnershealthcare Consultants -India and would encourage you to make the decision and place yourself in the expert hands of this world class medical tourism company.